The New Zealand Ambassador to Ireland has thanked the Irish people for their outpouring of support in the wake of yesterday's shootings in Christchurch. Brad Burgess said New Zealanders are in shock that such an attack has happened in their community, but they are determined not to let it change their way of life. The ambassador said New Zealand represents diversity, kindness and compassion, and that he is heartened by his people's response to the tragedy. 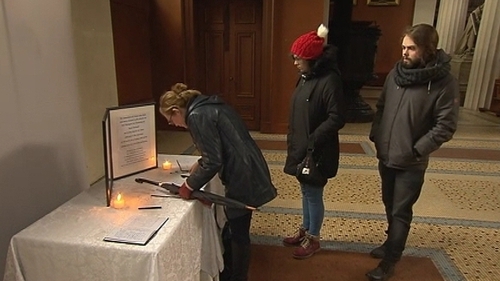 Books of condolence for the victims of the Christchurch mosque attacks were opened at Dublin's Pro-Cathedral at 11am this morning. A spokeswoman for the archdiocese said the church will re-open at 10am on Sunday morning in advance of a short remembrance service for the dead and injured, which will be led by Archbishop Diarmuid Martin between 10.30 and 10.50am. The service will be attended by President Michael D Higgins, who will then attend the 11am mass at the Pro-Cathedral. The church will then close for St Patrick's Day at 12.30pm. Archbishop Martin has invited people who will be in Dublin city on the national holiday to join in the service which, he says, will renew the rejection by Christian believers of all forms of religious and racial intolerance. On Monday, the books of condolence will be available for signing from 10am. And on Tuesday and Wednesday, books may be signed at the Pro-Cathedral between 10am and 2pm. The Lord Mayor of Cork, Mick Finn, yesterday signed the city's book of condolence for the victims and survivors of the mosque attacks. The public may sign it during working hours (9am to 5pm) on weekdays for the next two weeks. City Hall will be closed on Monday, which is a bank holiday. Meanwhile, Limerick City and County Council has opened an online book of condolence. It invited the public to express solidarity with the people of Christchurch and in memory of the victims of the terror attack. The council website says it will remain open until Friday 22 March 2019.